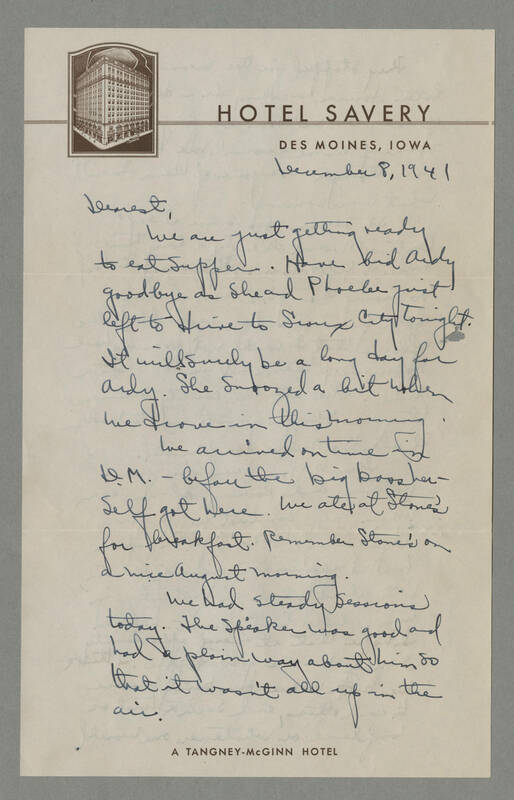 [HOTEL SAVERY Des Moines letterhead] December 8, 1941 Dearest, We are just getting ready to eat supper. Have bid Ardy goodbye as she and Phoebe just left to drive to Sioux City tonight. It will surely be a long day for Ardy. She snoozed a bit when we drove this morning. We arrived on time in D.M. - before the big boss herself got here. We ate at Stone's for breakfast. Remember Stone's on a nice August morning. We had steady sessions today. The speaker was good and had a plain way about him so that it wasn't all up in the air.